Figure 17.1. Two models for the activation of the heme-regulated protein kinase (HCR). A: Activation by homodimer dissociation. B: Activation by heterodimer dissociation with subsequent phosphorylation. See the text for more details. (Reproduced from M.J. Clemens, in "Translational Control", J.W.B. Hershey, M.B. Mathews & N. Sonenberg, eds., p.p. 139-172, CSHL Press, 1996, with permission). The phosphorylation of eIF2, seemingly being a regulatory response of the cell to viral infection (down-regulation of total protein synthesis), in its turn can be regulated by a virus (down-regulation of phosphorylation). Indeed, many viruses encode or induce a factor that prevents the phosphorylation of eIF2 (for a review, see, e.g., Hovanessian, 1993). For example, adenovirus produces small transcripts, VA-RNAs (I and II), that can bind to the latent PKR and block the activation of its kinase activity (Schneider, 1996). Epstein-Barr virus also generates small RNAs - EBER-1 and EBER-2 - which bind to the kinase and prevent its activation (Clarke et al., 1991; Mathews, 1996). Poliovirus, at the early stage of the infection, induces proteolytic degradation of the kinase (Black et al., 1989). Influenza virus stimulates the production of a cellular, not a viral-encoded protein, p58, possessing a strong inhibitory effect on the kinase (Katze, 1996). All this permits to circumvent the protective down-regulation exerted by the host and to restore the high rate of general protein synthesis required for high viral production. Figure 17.2. A model for the activation of the dsRNA-regulated protein kinase (PKR): activation by dimerization on dsRNA with subsequent trans- and autophosphorylation and dissociation. KD is kinase domain, and dsRBM1 and dsRBM2 are dsRNA-binding motifs of the enzyme molecule. See the text for more details. kinases, ribosomal protein S6 kinase, cAMP-dependent kinase, etc. (reviewed by Huembelin & Thomas, 1991; Proud, 1992). The functional significance of these phosphorylations, however, is not clear. In any case, they are active in the phosphorylated state, and there are reports about the positive correlation between their enhanced phosphorylation and the enhanced protein synthetic activity. With two cap-binding factors, eIF4E and eIF4F, the phosphorylation has been directly shown to be either absolutely required for activity (phosphorylation at Ser-53 in eIF4E), or strongly stimulatory (multiple phosphorylation in the 220 kDa subunit of eIF4F) (Rhoads et al., 1993; Frederickson & Sonenberg, 1993; Sonenberg, 1996). It is not excluded that these phosphorylations, and especially the critical one-site phosphorylation of eIF4E, may play a regulatory role in the rate of translational initiation in Eukaryotes. The point is that eIF4E, as a cap-binding subunit of eIF4F, seems to be one of the most limiting component in the initiation machinery, and thus the amount of the active subunit determines the amount of the complete functional eIF4F which is responsible for the cap-dependent initiation. At the same time, the main role in the regulation of the eIF4E level in the cell may be played by phosphorylation of a special protein called 4E-binding protein, or 4E-BP, rather than by phosphorylation of the eIF4E itself. The 4E-BP forms an inactive complex with eIF4E and thus depletes it from the medium. Phosphorylation of the 4E-BP by mitogen-activated kinase (MAP) induced by insulin or growth factors has been shown to result in the dissociation of the complex and the release of the active eIF4E (Sonenberg, 1996). In all considerations of translational aspects of protein synthesis in Eukaryotes it should be always taken into account that eukaryotic mRNAs never exist as free polynucleotides but only in the form of messenger ribonucleoproteins (mRNPs). The problem of structural organisation and functional significance of mRNPs, despite the 30 years history, is still far from its solution. Functionally, the proteins complexed with mRNA can exert very different effects, from stimulation of translation to complete "masking" of mRNA. Some effects are total and will be discussed here, whereas other effects are mRNA-specific and will be considered in the corresponding sections below. Among a variety of proteins in mRNPs of different origin and intracellular localisation, there is the major protein component called p50 (for reviews, see Spirin, 1994, 1996; Wolffe, 1994; see also Sommerville, 1992; Murray et al., 1992; Minich et al., 1993; Evdokimova et al., 1995). It is bound to heterogeneous mRNA sequences both in free cytoplasmic mRNP particles and in polyribosomes. It seems to have no preference for any special sequences in mRNAs including coding and untranslated regions (though probably having a higher affinity for G-rich regions), but poly(A) tails, double-stranded RNAs, tRNAs and ribosomal RNAs are incapable of strongly binding to the p50. The p50 is present in many copies per mRNA chain, possesses the strongest affinity to heterogeneous mRNA sequences among other mRNA-binding proteins and can be qualified as a core protein component of mRNPs. The p50 component of free and polysomal mRNPs has several peculiar characteristics. First of all, this ubiquitous protein component of eukaryotic mRNPs is found to be not a single protein but a family of closely related proteins, with high sequence homology. Very often (but not always), a pair of the proteins of this family is present in mRNPs of a given origin. The family includes the DNA-binding transcription factors stimulating the synthesis of mRNAs from the so-called Y-box-containing promoters. At least in several cases the same proteins were revealed both as nuclear Y-box transcription factors and as major cytoplasmic mRNP-forming components. They are not present in nuclear hnRNPs and not accumulated in nuclei in a detectable amount, thus being predominantly cytoplasmic proteins. The proteins are basic, have the isoelectric point (pI) about 9.5, and generally contain a large proportion of charged amino acids. They are also characterised by unusually high content of glycine. The unusual amino acid composition of the proteins may explain their anomalous electrophoretic behaviour in the presence of sodium dodecylsulfate: the apparent molecular mass as estimated from the SDS-electrophoresis (50 kDa) is found to be significantly higher than the real molecular mass of about 35 kDa. In mRNPs they are multiple-phosphorylated. In the free state they form large aggregates or particles sedimenting at 18S (molecular mass of about 106) and also phosphorylatable. The interaction with mRNA results in rather extensive melting of the RNA secondary structure and increased exposure of the RNA to nucleolytic attack. Thus, all mRNA in the cytoplasm is complexed with the p50, and the interaction seems to be rather strong. It means that the eukaryotic translational machinery deals with this matter, not with just polyribonucleotide sequences and their intrinsic secondary and tertiary structures. It can be expected that the presence of the bound protein molecules along all mRNA sequence and the partially melted state of mRNA secondary structure must exert serious effects on initiation and elongation mechanisms. The presence of the p50 on the translatable mRNA in polyribosomes suggests the positive contribution of the protein to translational initiation and/or elongation. Indeed, stimulation of translation of exogenous mRNA in a cell-free system by relatively low concentrations of the p50 was reported. On the other hand, however, the same in vitro experiments have demonstrated the negative contribution: the increase of the ratio of the p50 to mRNA in cell-free systems inhibited translation. In agreement with this, the mRNPs isolated from polyribosomes and retaining their p50 content are well translatable, whereas the free mRNPs with higher content of the p50 are either non-translatable, or translatable only with the help of a special activator system (probably, including eIF4F). In vivo observations indicate that the increased accumulation of the p50 in the cell correlates with the inhibition of protein synthesis. Such accumulation is typical of germ cells, i.e. oocytes and spermatocytes, known to contain inactive, or masked mRNA (see below, Section 17.5). Artificial overexpression of the p50 in somatic cells is also inhibitory for translation. From this the hypothesis has been proposed that the p50 can be responsible for global down-regulation of translation by sequence-nonspecific interactions with mRNAs. Yet, the presence of the p50 on mRNA in translating polyribosomes does not fit well the hypothesis in its straightforward form and requires elucidation. In any case, it is likely that the p50, the sequence-nonspecific mRNA-binding protein responsible for the formation of the cytoplasmic mRNPs, plays an important role in global regulation of translation in eukaryotic cells. The level of this protein in the cytoplasm may regulate the expressivity of mRNA. For example, the degree of saturation of mRNA with the protein may govern conformational transitions of mRNPs thus modulating the accessibility of mRNA for translation factors and ribosomes. This is the open field for further investigations. Like in Prokaryotes, different mRNAs of Eukaryotes possess different "strength" in initiation of their translation, i.e., they initiate with different rates. This is basically determined by their structure, and first of all by the structure of their 5'-terminal regions and the regions around the initiation codon. Two main parameters may play a decisive role: (1) the availability and the affinity of these mRNA structures for ribosomes (for initiating small ribosomal subunit), and (2) the affinity of these structures for a limiting RNA-binding initiation factor, such as eIF4F. As discussed in Section 16.2., the discrimination of mRNAs by initiating ribosomal particles is typical of Prokaryotes. As to Eukaryotes, a similar phenomenon of the mRNA discrimination by the initiating 40S ribosomal subunits may be also possible in some cases. The classical example where this model of translational discrimination (Lodish, 1976) was applied is different translation rates of the mRNAs encoding for a- and b-globin chains in mammalian (e.g., rabbit) reticulocytes. The b-globin mRNA was shown to be more effective message than the a-globin mRNA (Lodish, 1971). At the same time, the elongation rate was shown to be identical in both cases (Lodish & Jacobsen, 1972). It is the initiation rate that has been shown to be responsible for the difference in translatability: each molecule of b-globin mRNA initiates translation 1.7 times more frequently as does each a-globin mRNA. In other words, the b-globin mRNA is "stronger" in initiation. To compensate for this difference and to produce equimolar quantities of a- and b-globin chains, the cell contains a correspondingly higher amount of mRNA for the a-globin than for b-globin. It can be supposed that the 5'-terminal sequence of b-globin mRNA has some structural characteristics determining its higher affinity for the initiating 40S ribosomal subunits. This model, however, cannot be accepted as ultimate: in the case of eukaryotic systems the competition between mRNAs for RNA-binding initiation factors, rather than for initiating ribosomal complexes, seems to be more realistic (see below, the following Section 17.3.2). As already mentioned, eukaryotic initiation factors can be grouped into two main categories: ribosome-binding proteins and mRNA-binding proteins. In most eukaryotic cells the mRNA-binding initiation factors, eIF4F and eIF4B, seem to be present in molar amounts less than the total molar amount of mRNA, i.e., there is a shortage of the mRNA-binding initiation factors. Hence, the competition between mRNAs for the factors exists. This situation is different from that described for Prokaryotes when the free competition between initiating ribosomal complexes for the mRNA initiation sites (RBS) is assumed. Here, in Eukaryotes, the competition between mRNAs for an initiation component takes place rather prior to their binding to the initiating ribosomal complex. In such a case, if different mRNAs vary in their affinities for the component (an mRNA-binding initiation factor), this will determine different "strengths" of the messages in initiation of their translation (Walden et al., 1981; Brendler et al., 1981 a, b; Godefroy & Thach, 1981). Two mRNA-binding initiation factors, eIF4F and eIF4B, can be considered as the candidates for the message-discriminatory components. Both factors are present in most eukaryotic cells in a limiting amount, and both were reported to vary in the affinities for different mRNAs or their 5'-terminal sequences. In many cases (e.g., in non-proliferating cells, such as rabbit reticulocytes) the situation with eIF4F is especially tight: its cap-binding 25 kDa subunit (eIF4E) is present in an amount of about 0.02 molecule per ribosome and thus seems to be the most limiting component of the translational initiation machinery. On the other hand, however, eIF4B possesses a fairly non-specific RNA-binding activity and may be required in many copies per mRNA for effective initiation. The mRNA encoding for ferritin, the iron-storing protein of Eukaryotes, is an example of a very competitive cellular mRNA. When the ferritin mRNA is derepressed and translated in vivo or in vitro, it outcompetes all other mRNAs. It has been demonstrated that a special secondary/tertiary structure fold ("FR") at the 5'-untranslated region of the ferritin mRNA, near to the cap, is responsible for a great part of this initiation rate "strength" (see below, Fig. 17.5). This "positive control element" of the ferritin mRNA may be considered as a selectively strong binding site for a limiting RNA-binding initiation factor. The problem of the competition between mRNAs for a limiting ("discriminatory") initiation factor was more thoroughly investigated, both theoretically and experimentally, for several cases of virus-infected cells or viral RNA-directed cell-free translation systems (e.g., Walden et al., 1981). The conclusions was that (1) viral and host mRNAs compete for a message-discriminatory component prior to their binding to the initiation 40S ribosomal complex, (2) this component (initiation factor) is limiting in virus-infected cells, and (3) a hierarchy exists among mRNAs in terms of their affinity for this component. Encephalomyocarditis (EMC) virus RNA was shown to be "stronger" than host mRNA. (There is evidence that the affinity of the EMC virus RNA for eIF4B is one order of magnitude greater than that of the "average" host mRNA). The host mRNA, however, was found to be "stronger" than several species of reovirus mRNA. At the same time, the reovirus RNA competes successfully with the host mRNA due to unusually high production, and hence very high amount of this RNA in infected cells. Among cellular mRNAs there is a class of poorly competing messages which are found predominantly in small-size polyribosomes and free mRNP particles. The investigation of the problem has led to the conclusion that their low competitive activity is due to the presence of a tightly bound protein -probably the core mRNP-forming protein (p50) discussed above (Section 17.2.2). The removal of the protein (e.g., by phenol treatment) makes them well competitive in cell-free translation systems. At the same time, the bound protein seems to be in equilibrium with free protein, and thus the situation simply reflects the fact that the mRNAs under consideration have lower affinity for initiation factors than for the mRNP protein which impedes the binding of the initiation factors. In any case, the competition between the mRNA-binding initiation factors and other mRNA-binding proteins must be taken into account when analysing the problem of translational discrimination of eukaryotic mRNAs. Another case is a strong mRNA-specific binding of a repressor protein which blocks the initiation of translation of a highly competitive mRNA, such as ferritin mRNA. It can do this due to the presence of a special secondary/tertiary structure at the 5'-untranslated region of a given mRNA with high affinity for a given protein. This case will be discussed below, in Section 17.4.1. Figure 17.3. Scheme illustrating the effect of the inhibition of elongation rate on the discrimination of mRNAs. The discriminatory initiation factor is shown to exist in one of the two states, either bound to mRNA (A) or free (B). Slowing the ribosomal elongation rate increases the average amount of time that the system spends in state B. This increases the steady state free factor concentration and hence the probability that the low affinity mRNA (indicated by the dotted line) will bind the discriminatory factor and thus be translated. (Reproduced from W.E. Walden, T. Godefroy-Colburn & R.E. Thach, J. Biol. Chem. 256, 11739-11746, 1981, with permission). free (not bound to mRNA) state for a longer time than in the case of fast elongation thus reducing the competition (Fig. 17.3). Under these conditions "weak" mRNAs receive better chances to initiate translation and therefore to be fairly expressed. Experiments with elongation inhibitors, such as cycloheximide, directly supported this expectation. For example, cycloheximide inhibited translation of "strong" host mRNA and stimulated translation of "weak" reovirus mRNAs in the virus-infected cells, as well as in cell-free systems. Likewise, the class of cellular mRNAs poorly translatable due to interference with mRNP-forming protein displays better translation upon the inhibition of total protein synthesis (elongation) by cycloheximide (Walden et al., 1981). The phenomenon of stimulation of translation of "weak" mRNAs when elongation rate is down-regulated can play an important physiological role in the cell. The matter is that mRNAs encoding for cytokines, protooncogenes and other proteins responsible for cell activation or G0 - G1 transition are usually "weak". Hence, Ca2+/calmodulin-induced phosphorylation of eEF2 and resultant inhibition of elongation (Section 13.4.2) must result in stimulation of translational initiation of these mRNAs and thus give an impulse to cell activation and/or proliferation (see Spirin & Ryazanov, 1991; Ryazanov & Spirin, 1993). Indeed, it has been demonstrated that transient phosphorylation of eEF2 - and probably immediate short-term reduction of protein synthesis - takes place at mitogenic stimulation of quiescent cells (Celis et al, 1990). Stimulation of quiescent cells and even their malignant transformation can be obtained by overexpression of eIF4E (Lazaris-Karatzas et al., 1990). This may be explained exactly in the same terms as above: the most limiting initiation factor, complete eIF4F, becomes more abundant and thus available for "weak" mRNAs, including protooncogene (e.g., c-fos, c-jun, c-myc) mRNAs (see Rhoads et al., 1993). In this way the up-regulation of an initiation component may result in the reduction of translational discrimination and lead to the effective expression of a new set of messages ("weak" mRNAs). The phosphorylation of eIF2a, as a response to heme deficiency, growth factor deprivation, amino acid starvation, heat shock, virus infection, etc., can produce an opposite effect on translational discrimination. As a result of phosphorylation, eIF2 becomes less available for initiation. Since eIF2 is a ribosome-binding factor converting passive 40S ribosomal subunits into active initiating 40S ribosomal complex, the less eIF2 is available the less initiating ribosomes are present. Under these conditions "strong" mRNAs will trap all limiting initiation components such as eIF4F and eIF4B, and translation of "weak" mRNAs will be even more reduced. Following the same logic, the modulation of translational discrimination of mRNAs at the level of initiation could be achieved also by changes of amount or activity of the mRNP-forming protein (see Section 17.2.2). The increase of the amount (or the RNA-binding activity, e.g., by phosphorylation) of the protein should propel the displacement of the mRNA-binding initiation factors from mRNAs and thus lead to the reduction of the discrimination, i.e. to the inhibition of translation of "strong" mRNAs and the stimulation of "weak" mRNAs. The addition of free "weak" mRNA or untranslatable RNA (e.g., antisense RNA) to a cell-free system, or overproduction of such an RNA in the cell should have an opposite effect: the mRNP protein would be bound and redistributed among more RNA molecules ("diluted"), and the limiting mRNA-binding initiation factors would serve almost exclusively "strong" mRNAs. Some viruses use another, more radical way to change the discrimination profile and to switch translational initiation predominantly on viral mRNAs. For example, many picornaviruses (enteroviruses, rhinoviruses and aphthoviruses) induce proteolytic degradation of p220 subunit (eIF4G) of eIF4F and thus switches off the cap-dependent initiation (see Ehrenfeld, 1996). As a result, the internal initiation on polioviral mRNA becomes advantageous. 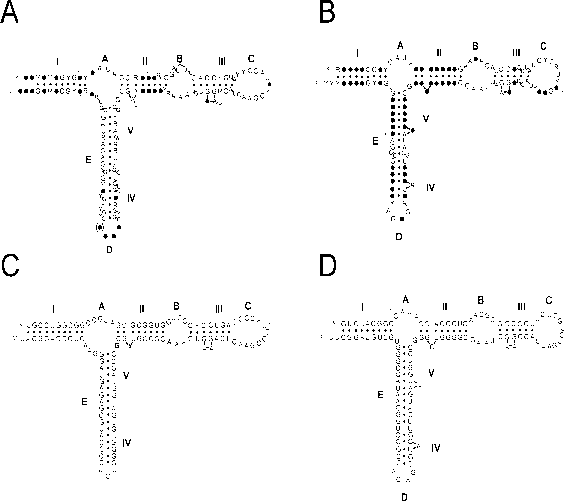 It is interesting that the picornavirus-encoded proteinases, such as the 2A proteinase of poliovirus and Lb proteinase of foot-and-mouth disease virus, split eIF4G into two parts, the N-terminal part which binds eIF4E and the C-terminal part which associates with eIF4A (and eIF3), thus disconnecting the cap-binding function and the helicase function of eIF4F. Correspondingly, the C-terminal product of the eIF4G cleavage, seemingly in association with eIF4A, has been shown to be inactive in the cap-dependent initiation, but very stimulatory in the internal (IRES-driven) initiation and generally in initiation of translation of uncapped mRNAs. It is not excluded that a similar mechanism may switch translation from "normal" mRNAs to heat-shock mRNAs during heat shock (for review, see Duncan, 1996). Indeed, many heat-shock mRNAs, especially in Drosophila, have long 5'-intranslated regions suggesting that ribosomes may not scan all these sequences to reach the initiation codon but rather initiate internally. The mRNAs encoding for some heat-shock proteins (e.g., HSP 70 mRNA of HeLa cells) have been shown to be translated in poliovirus-infected cells, i.e., presumably by a cap-independent mechanism. The experiments with inhibition of expression of eIF4E by antisense RNA demonstrated that the decrease in the amount of eIF4E in the cell was accompanied, as expected, by the reduction of the total proteins synthesis, but the synthesis of heat-shock proteins was unaffected, again suggesting a cap-independent mechanism of translational initiation (Rhoads et al., 1993). Extensive dephosphorylation of eIF4E subunit during heat shock may be one of the possible mechanisms of inactivation of the whole eIF4F complex as a cap-binding initiation factor. There are eukaryotic mRNAs where the coding sequence is preceded by one or several short open reading frames (ORFs) with their own initiation and termination codons. Assuming the mechanism of scanning of a message from 5'-end by initiating ribosomal particles in Eukaryotes, this implies that the translation of the main coding sequence proceeds via termination of the upstream short ORF and reinitiation. Like in Prokaryotes (see Section 16.3.2), the reinitiation can take place both downstream and upstream (when both coding sequences overlap) of the termination codon of the preceding ORF. In contrast to Prokaryotes, however, the presence of an upstream ORF in a eukaryotic mRNA usually weakens the expression of the following coding sequence (for review, see Geballe, 1996). The weakening can be a simple consequence of a low efficiency of reinitiation in Eukaryotes: only a fraction of the terminated ribosomes remains bound to mRNA and can start a new scanning run. In such cases the sequence of a short ORF and the sequence of an ORF-encoded peptide may have no significance. In other cases the inefficiency of reinitiation can be enhanced by the peptide synthesised on ORF; it seems that some short ORFs encode peptides with special sequences inhibitory for ORF termination. The possibilities of positive contributions of upstream short ORFs should be also mentioned. First of all, translation of upstream ORFs can unwind some stable secondary/tertiary structural elements of the 5'-UTR inhibitory for non-translating scanning ribosomes. Favourable translation-induced reorganisations of secondary/tertiary structure of the 5'-UTR should be attributed to the same category of possible positive effects. Second, some unique combinations of structural elements with short ORFs may exist that induce skipping (shunting) of long sequences and inhibitory stable structures within the 5'-UTR by scanning ribosomal initiation complex. 13.2.4). The examples of mRNAs with upstream ORFs encoding for such inhibitory peptides are mammalian S-adenosylmethionine decarboxylase mRNA, yeast CPA1 mRNA coding for an enzyme of arginine biosynthesis, and human cytomegalovirus gp48 mRNA (reviewed by Geballe, 1996). The length of the peptides are from 6 to 25 in the above cases; their amino acid sequences, rather than the nucleotide sequences of the ORFs, have been directly shown to be critical for the inhibitory effect. The inhibition of the downstream translation by the upstream ORFs can be regulated by some trans-factors and environmental conditions. Thus, translation of S-adenosylmethionine decarboxylase mRNA which is inhibited by the upstream ORF in resting T cells becomes activated upon T-cell stimulation (Fig. 17.4). Efficient translation of the of S-adenosylmethionine decarboxylase mRNA in the stimulated T cells, as well as in non-T-cell lines, seems to result from an inefficient use (ignoring) of the ORF initiation codon by scanning ribosomal particles under these conditions.